In Year 4 we have started Big writing! Once a week we get suprised with a different writing genre. We then get our fancy big write books and our cool big write pencils out and write independently. 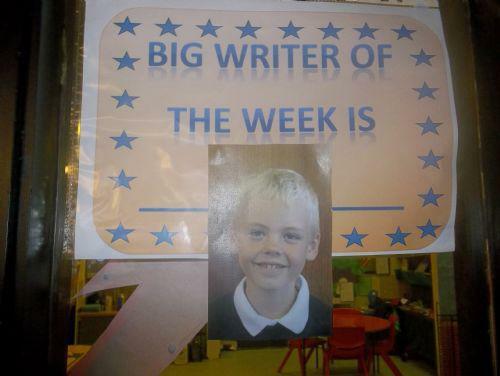 Once Miss Grimes has read our writing she chooses a big writer of the week- they get their photograph and writing up in the classroom. You can now also find out who is big writer of the week online! 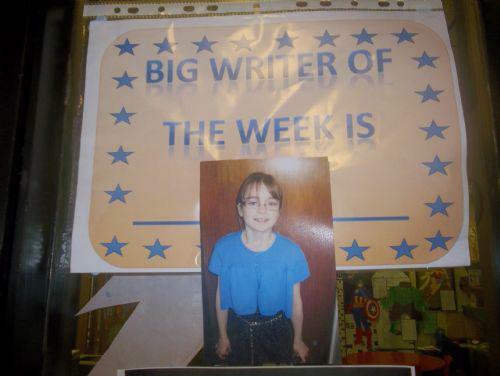 15/03/2013 Amy has won the big writer of the week award for her setting description. This week Abbey won the big write of the week for her fun-filled, magical playscript. Well done Abbey! This week we wrote magical stories- Nathan got chosen as big writer of the week for his fantastic setting description and exciting vocabulary he used!